To progress in their careers, lab managers, particularly those in their first management assignment, need to develop new skills. Often they had little opportunity to do this while working full time at the laboratory bench. Yet these skills are critical to success in their new management assignment. Usually each laboratory has its own methods for managers to manage their budget. These are usually based on the tracking of spending versus time. Good spreadsheet software will let managers do this. They track spending by month with the goal of keeping each project and activity on budget. New and transferred managers inherit the budget of their predecessors. However, in the next budget year they will have to work with their own supervisor and project team members to develop budgets for the coming financial year. Meetings require a lot of planning and follow-up to be useful management tools. Define the meeting objectives and desired outcomes during the planning phase. This means defining what needs to be accomplished during your meeting to make it successful. Then put together a meeting agenda that will accomplish this goal. Next, use the agenda to determine which people need to attend the meeting. Keep the attendance list as short as possible to accomplish your objectives. Send copies of the agenda to all attendees a few days prior to the meeting and ask for their input. Include the objective of the meeting at the top of the agenda. You need to help meeting attendees prepare to actively participate in the meeting so they can offer intelligent input as well as listen. Decide if you need to bring in a meeting facilitator to keep the meeting focused and on track. During the meeting, experienced meeting facilitators can also identify overlooked subjects or areas. Before the meeting, determine the appropriate technology for the meeting. For example, are you going to use flip charts, white boards, or LCS projectors and a computer to project and record information? Are you going to designate someone as a scribe to take notes and prepare the meeting minutes? Now it is time for the meeting. Use all of your premeeting activities to manage the meeting. Be sure that all attendees are engaged and offer input as appropriate. In particular, use time management skills to keep discussion of each business item on schedule so that the meeting does not run late. Post-meeting activities are important. Most important is to review action items decided upon during the meeting, the individuals responsible for each, and the time each action item should be completed. Meeting minutes remind attendees of these action items and allow nonattendees to get information from the meeting even if they didn’t attend. “In Search of Excellence.”1 However, this technique is often forgotten, given the many demands on a manager’s time. Yet its advantages make it well worth it. Because the word “wandering” is part of the name of the method, it sounds purposeless.2 Far from it. MBWA means occasionally walking through the laboratories in an unstructured manner, informally discussing the status of ongoing work with staff members. The atmosphere is relaxed and informal. Staff members often express concerns they would not mention in a formal meeting or would raise only in a performance review (often scheduled months away). MBWA enables managers to show their concern. Having managers who are engaged in their work helps staff members feel their work is important and strengthens their engagement. One of the best managers I ever had began her new assignment by walking around and meeting her staff members in their labs and offices. She used these discussions to get to know her staff members and learn how to facilitate their achievements. These initial discussions set a positive tone that lasted for the three years of her assignment as research supervisor. Management is more than just administration; it’s also leadership. 3 Effective, timely decision-making is an essential part of leadership. Leaders gather information, consider alternatives and then set a clear course of action. In addition to considering the data itself, managers need to consider its source and thus its value. Decisions are often based on intuition as well as data. Industrial R&D is increasingly being accomplished through open innovation processes.5 Managers and qualified staff members need to play important roles in the selection of open innovation partners and helping to define the terms under which outside organizations will work with your laboratory on projects. Customarily, this work is done under contract.6 Issues such as defining the roles of each partner, project milestones, determining how to decide if milestones have been met, and the amount of the milestone payments have to be discussed and negotiated. Once the contracts have been signed, the lab manager should be involved in monitoring the working relationship between his/her staff members and the other parties to the contract. Many laboratories have had their budgets reduced due to the depressed business conditions of the recession and the current weak economic recovery. This means lab managers are being forced to do more with fewer financial resources. How can you do this? One strategy is to refurbish your current equipment such as balances, centrifuges, microscopes and spectroscopic instruments to extend their useful operating life rather than replacing them with new ones. Another strategy is to buy refurbished equipment and instruments rather than new ones. Consider changing your hiring practices. Rather than hiring a new full-time employee, can you hire a qualified person to work part-time instead? The use of part-timers could enable important work to get done with less impact on your personnel expenses. Some unemployed individuals might be happy to work part-time rather than not have a job at all. Perhaps some of your laboratory’s retirees would like to work on a part-time basis. With fewer staff and financial resources, lab managers will find it more difficult to effectively manage conflicting priorities. Strategies and methods for doing so were discussed at length in an earlier Lab Management Magazine article.7 In essence, they involve using numerical methods and information technology for establishing priorities. Managers, particularly newly appointed ones, should consult their supervisor when using these methods. It may also be appropriate to consult staff members and other members of project teams, including customers and suppliers, when engaged in this exercise. Managers have to deal with cultural issues associated with the diversity of their laboratory staff members. These are gender, racial and cultural diversity. Members of the so-called Generation X and millennials (also called Generation Y) have different attitudes than baby boomers toward their work as well. For example, millennials often have different priorities when balancing work and family demands than do baby boomers. This diversity means that lab managers must, within permissible company limits, use different management strategies with different employees. For example, managers must know what motivates their various staff members so they use the appropriate strategies to promote engagement and reward each employee for outstanding performance. Personal integrity is essential to earning and keeping the trust and respect of your staff members and peers. To be an effective manager and leader, you must always tell the truth. If you don’t know the answer or are precluded from giving it by corporate confidentiality considerations, don’t lie in order to have something to say. Managers may be confronted with moral or legal choices with regard to legal and business issues. They must always make the ethical choice. For example, a patent litigation developed at a former employer of mine. As part of the litigation, laboratory notebooks and reports had to be meticulously examined. While this was being done it became clear that one inventor had been left off the patent application. Although this inventor never complained about it, my employer did the ethical thing and corrected the inventorship, even though it was embarrassing to do so more than two years after the patent application had been filed. In another situation I observed personally, a capable young chemist lost his job in a small layoff. Knowing his staff members were upset, the research department manager called his staff together to explain the situation. However, he then lied regarding the reason the chemist lost his job. He immediately lost the respect of his staff, and he never regained it. The situation negatively affected both department morale and the manager’s effectiveness. Many companies send their new managers and lab staff members they are considering for management assignments to training courses on the management techniques discussed above. However, this is less common at small firms. Many large companies cut back their training programs during the recession and have yet to restore them. In addition, few of these courses are customized for lab managers. So attendees have to devote some creative thought to how they can apply the principles being taught. What can you do if formal management training programs are not available? The best approach is to use your own manager as a mentor and advisor. Consulting with other recently promoted lab managers will allow you to share common problems and develop solutions. Even after mastering your current responsibilities, you need to keep learning and growing. Accept stretch assignments that expand your capabilities and increase your knowledge base about your firm, its businesses and the external world in which your company operates. 1. T. Peters and R.H. Waterman, “In Search of Excellence: Lessons from America’s Best-run Companies,” Harper Paperbacks (2004). 3. Mike Mears, “Leadership Elements: A Guide to Building Trust,” iUniverse (2009). 4. 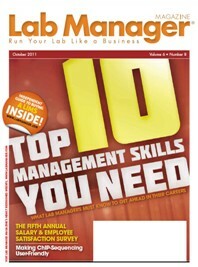 J.K. Borchardt, “Managing Crisis,” Lab Manager Magazine, https://www.labmanager.com/articles.asp?ID=820. 5. J.K. Borchardt, “Open Innovation Becoming Key to R&D Success,” Lab Manager Magazine, http://www.labmgr.com/ articles.asp?pid=163. 6. J.K. Borchardt, “Open Innovation: Presenting New Opportunities for Contract Managers,” Lab Contract Manager, www. ncmahq.org/files/Articles/CM0608_26-35.pdf/. 7. J.K. Borchardt, “Competing Priorities,” Lab Manager Magazine, https://www.labmanager.com/articles.asp?ID=635.